Super slim, lightweight and drinking water safe by design, the Water Right polyurethane garden hose is soft, flexible and effortless to use. We can honestly say that you have never used anything like it. Proudly manufactured in Oregon, using only top quality materials from Bayer Material Science, our polyurethane is safe to drink by using NSF grade polyurethane and is 100-percent free from toxic chemicals such as lead, BPA and phthalates often found in other garden hoses. Our commercial grade machined brass fittings are crush proof, rugged and are specially plated with environmentally responsible trivalent chrome. Each hose uses specially engineered strain reliefs on both ends to prevent hose kink at the faucet or nozzle end of the hose. The 7/16-inch inside diameter design handles up to 4 gallons per minute flow rate which is dreamy for most any job around the home, garden or shop. The 400 series polyurethane garden hose weighs only 3 pounds for every 50-feet and has a substantial burst pressure rating of 400 PSI. Water Right polyurethane hose stays flexible in all weather conditions—hot, cold, and even freezing temperatures. Polyether-based polyurethane is designed for long-term water use, eliminates permanent kinks, cracks, leaky connections and the dreaded hose rupture. 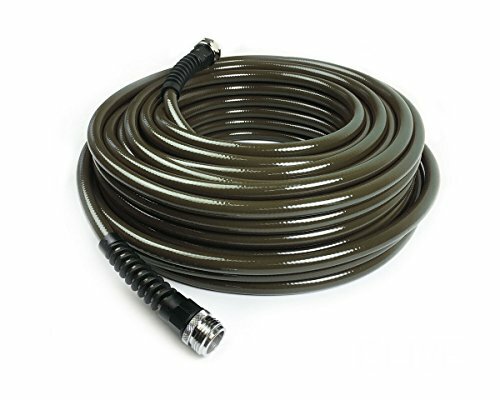 Great for just about anything around your home and is a perfect hose to be used for drinking water safe RV hose, boat wash down hose, horse stalls, greenhouses, retail store plant watering, car detailing. Available in elegant designer colors. Water Right. American Innovation. American Jobs. American Family Owned. NSF and FDA certified polyurethane resin for safe drinking water. Tasteless and odorless as compared to pvc or vinyl hose. Industrial grade brass chrome-plated, lead free fittings are long-lasting, non-tarnishing, & crush-resistant.